Today’s Employee pick is from Pat at our Harbison location! She chose the incredibly cute Hershey’s Kiss collection! Why did you pick this collection of jewelry? – They are a very unique style of jewelry, that is great for a birthday gift or Christmas gift. It’s a kiss that lasts forever! Do they just make pendants only? – Not only do we have pendants, they also come in earrings and bracelets. Anything else you’d like for customers to know about this jewelry collection? – The collection comes in sterling silver, some include crystals or diamonds. The pendants come with 18″ chains. Some of the pendants are lockets, some are 3 dimensional, and some of the kiss pendants lay flat on your neck. The Kisses also come in 3 different sizes, small, medium and large. Thanks Pat! Click here to see our collection of Hershey’s Kisses online, or come in our stores for our newest pieces not yet online. Check out more information about the Hershey’s Kiss Jewelry below. 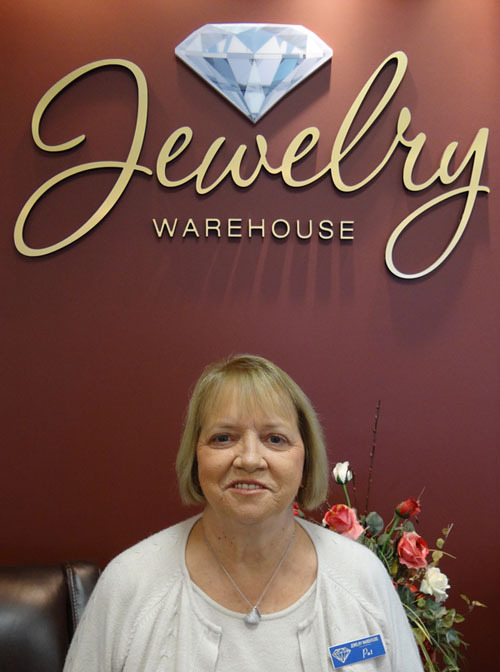 About the company that makes Hershey’s Kiss Jewelry – Twenty seven years ago a retail jewelry store was opened on Nassau Street in NYC. After a few years, an opportunity presented itself and a second store was opened at the World Trade Center. With this transition the establishment of the New Company name evolved – “World Trade Jewelers”. Then with the wake of the terrible tragedy on September 11, 2001 the business owners decided to take this time to jumpstart the wholesale division which leads us into today’s story. 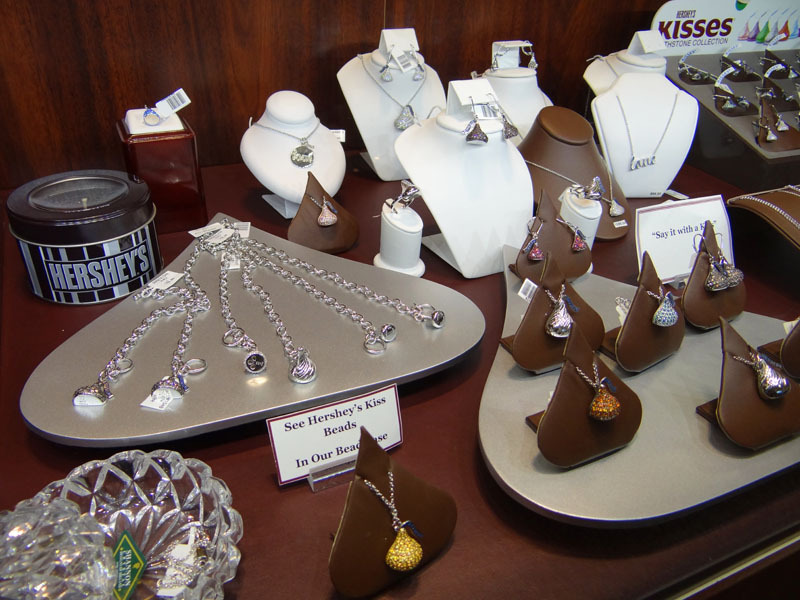 A new diamond wholesale jewelry business plan went into action in 2002 and along with it came licensing opportunities like the Hershey’s Kiss. 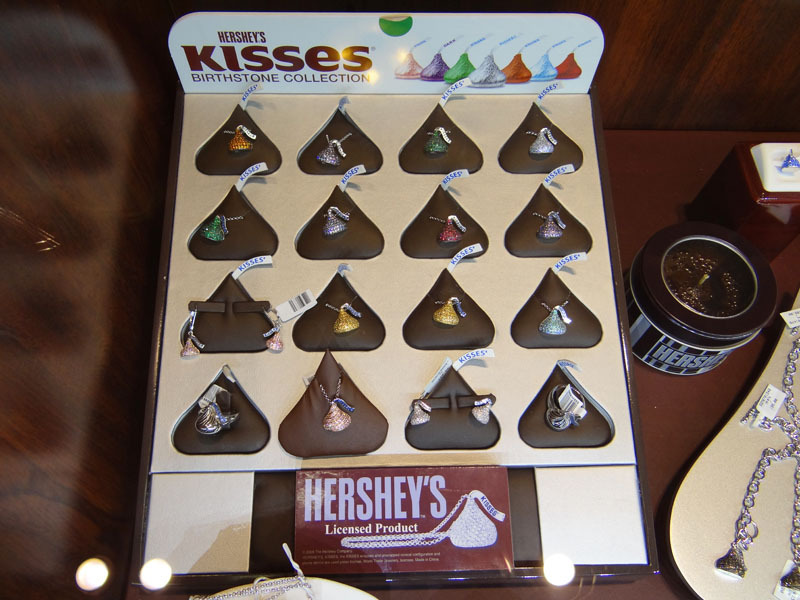 Few times has a Brand such as Hershey’s paired themselves with a Fine Jewelry house. This new found relationship has been a fun and exciting partnership. The relationship has paved the way for multiple jewelry venues which has allowed “World Trade Jewelers” to cross over into Fashion as well as Fine Jewelry products. The wholesale company has developed Hershey’s products in Gold, Gold and Diamond, Silver, Silver and Diamond. Soon to arrive in the Hershey’s family of products are Silver and Cubic Zirconia, & Base Metal jewelry items. These varieties of components offer an array of Hershey products that will satisfy every level of retail establishment and consumer. 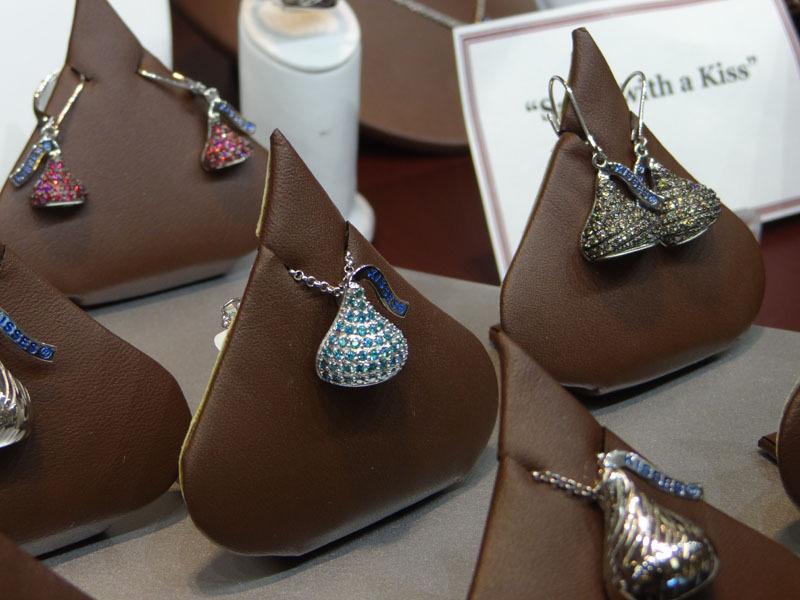 The Hershey’s Kiss jewelry line of products was introduced into the market at the JCK Las Vegas show in June 2009. World Trade Jewelers has enjoyed tremendous accolades for producing a valued product in these challenging times. 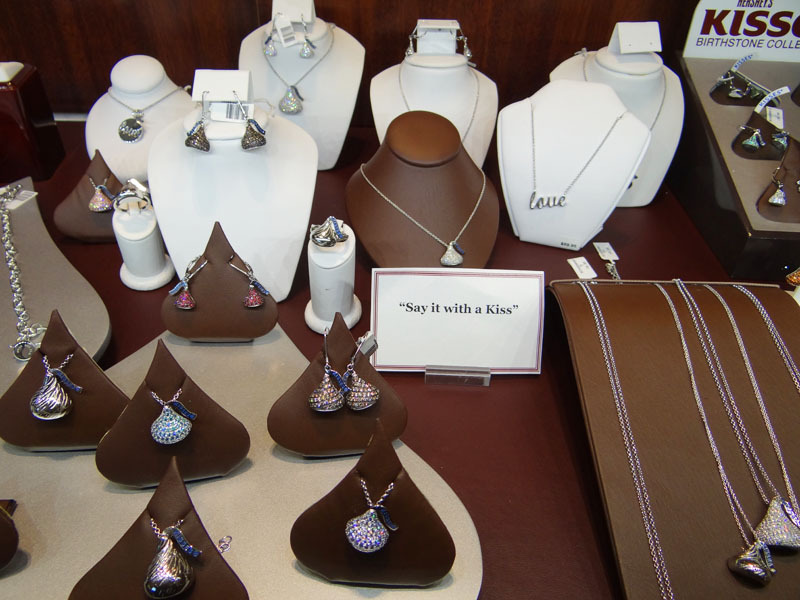 The Hershey’s Kiss Jewelry item is becoming a staple and a symbol of love “The New Heart” item. Soon everyone will want to be adorned by “A Kiss that Lasts Forever” TM. This entry was posted in Employee Picks, Jewelry, Jewelry Brands, Jewelry Trends, Pick of the Week and tagged hershey's jewelry, hershey's kiss pendant, hersheys kiss, jewelry warehouse, kiss jewelry, silver jewelry. Bookmark the permalink.